A very well designed three-bedroom semi-detached home situated in a delightful, quiet cul-de-sac within the highly regarded Hazel Farm development of West Totton. 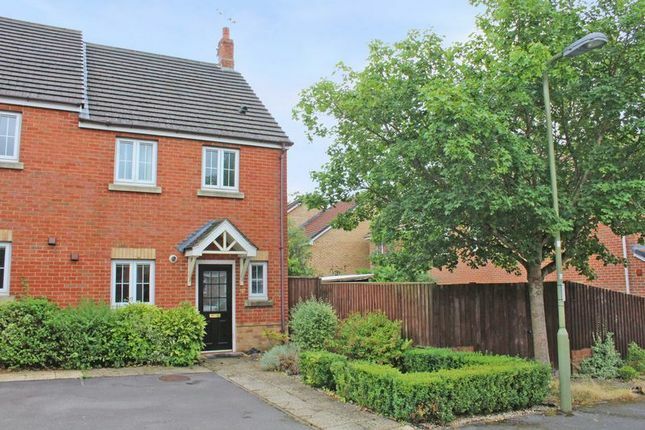 A pretty and modern ideal first home, situated in a pleasant residential cul-de-sac within easy reach of commuting links. Presented in neutral tones, this attractive home offers well proportioned accommodation in a low maintenance capacity benefitting from a well sized rear garden and parking for up to two cars. An attractive, secure door leads to the entrance hall which sets the tone for the neutral décor of this home. The hallway offers access to the kitchen, lounge and downstairs cloakroom which features a modern white suite. The attractive fitted kitchen is equipped with an extensive range of beech eye and base level units and ample roll edge marble effect worktops. The integrated appliances include a gas hob, cooker and concealed extractor hood with space and plumbing for further appliances. The lounge is a spacious, beautifully bright featuring a large picture window and French doors to the rear garden. This room offers ample space for a sizeable lounge suite whilst easily accommodating a dining table and chairs. There is further storage via the under stairs cupboard. The landing with airing cupboard and loft hatch offers access to three well proportioned bedrooms, the larger two benefitting from generous recessed wardrobe space. A family bathroom completes the accommodation and is fitted with a modern white suite with a shower and shower guard over the bath. The contrasting ceramic tilled floors and walls are a pleasant feature of the bathroom. The property enjoys a private position approached by a driveway which can accommodate two cars and evergreen shrub boarders. A pedestrian gate provides side access to the feature rear garden which enjoys a high degree of privacy, fully enclosed by panel fencing. The rear garden is of a good size and is a low maintenance area with a large patio, ideal for summer entertaining. A shingled border is interspersed with mature ornamental shrubs and a central circular paved area. To the rear there is a large storage shed and seating area. This property is situated in a quiet cul de sac in the popular residential development on the outskirts of Totton which offers excellent recreational and shopping facilities in addition to a mainline station with links to Southampton, London, Bournemouth and Poole. From junction 2 of the M27, proceed along the A326 towards Totton. At the first roundabout take the first exit into Michigan Way and then the first left into Garland Way. Take the second left into Oleander Drive turning right at Barberry Drive. At the junction turn left and follow the road around with Georgina Close on your left hand side.